Joy Lynn: This movie is based on a book and the true life story of Billy Beane, General Manager of the Oakland A’s. 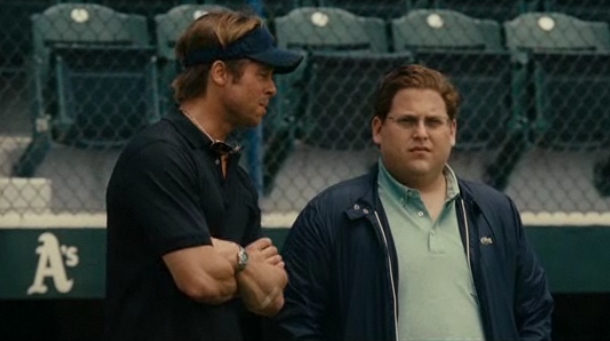 Brad Pitt plays Billy Beane. The A’s are struggling with losing their star players to teams with bigger budgets and Beane hires Peter Brand (Jonah Hill) to help him pick players. Brand (Hill) is a Yale graduate with a degree in economics and his skill is player analysis; his first job out of college. Brand uses statistic calculations (the Moneyball theory) to separate out the strong players and to find the more undesirable recruits (misfits) that have talent, but have been overlooked. Unlike Contagion (2011) the statistical equations are not the focus in this movie, the relationships and characters in this movie are well developed with intriguing dialogue and interest thanks to writer Aaron Sorkin. (The Social Network (2010), West Wing TV, etc.) Brad Pitt is as handsome as ever in this film! Jonah Hill is an excellent counterpart as Beane’s (Pitt) assistant. Both are great in this movie. They work well together as business partners and provide some humorous entertainment as you might expect. Non-sports fans will like this movie—it’s for all ages and genders. TMG: Hey, it’s a baseball movie. I let Joy Lynn take the lead on this because she loved the movie. Fine. But it’s just a baseball movie. Some fun stuff, lots of macho and the slow pace of baseball. On the plus side, you get baseball. It is a relaxing film. I ordered a hot dog and a beer and sat back. Only thing missing for me was the smell of cigarettes, the sun in my eyes, a hard plastic seat and a guy shouting “frosty malts,…get your frosty malts.” On the plus side, is we get some real “inside baseball” insight. Baseball is 95% statistics and Billy Beane tried to exploit that reality. It worked, but probably was a fluke. The fact is baseball has great athletes and non athletes who make it to the top. Pro baseball has kids who were all stars and some guys who just get lucky…but statistics follow them everywhere. Hitting a 98 mile an hour curve ball is about one of the most difficult things mankind can achieve. It exceeds flying to the moon and back. If you can do it well, you have incredible eyes and and incredible timing–that is purely a gift from God. Athleticism has much less to do with it. Ever see a picture of Babe Ruth? Mr. Athlete he was not. Most everything else in baseball is just superstition and luck. I think the story was fair to that truth. My rating would be more in the 7.0 range, statistically speaking.